Discovered by Nicholas Louis de Lacaille on March 17, 1752. 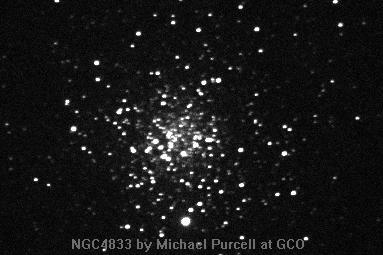 The southern globular cluster NGC 4833 was discovered by Nicholas Louis de Lacaille during his 1751-1752 journey to South Africa. The image in this page was obtained by Michael Purcell from the Grove Creek Observatory, Australia, with a C-14 telescope at f/7 and ST-7 CCD camera on April 28, 1998 at 18:52:30 UT. It was exposed for 30 sec. In the Astronomical League's Southern Sky Binocular Club list. Caldwell 105 in Patrick Moore's list.